The leader of a North Carolina terrorist ring pleaded guilty Wednesday to charges related to a plot to wage violent jihad overseas, in a New Bern, N.C., court. Daniel Patrick Boyd admitted to conspiring to provide material support to terrorists and to conspiring to murder, kidnap and maim people in a foreign country. Boyd, according to a superseding indictment, trained for battle in terrorist camps in Pakistan and Afghanistan in the late 1980s and early 1990s. During these travels, Boyd claimed he met Osama bin Laden mentor Abdullah Azzam and spent time fighting the Soviets in Afghanistan. Beginning in 2006, Boyd conspired with seven others to train and raise money for violent activities abroad. The men continued their involvement in these activities until their 2009 arrests. Boyd "admitted to his role in a multi-year conspiracy to advance violent jihad by recruiting and helping young men travel overseas to murder, kidnap, maim and injure persons," Assistant U.S. Attorney General David Kris explained in a statement. An informant recorded Boyd during the training and in his sermons. "Allah knows, I love jihad," Boyd said in a June 2009 recording, "I love to stand there and fight for the sake of Allah and know there is nothing in front of me except the battlefield and the kuffar (infidels)." In that same conversation, he told his co-conspirators that "the Mujahid (holy warrior) on the battlefield is the safest position possible, because the one who fights physically for the sake of Allah, does not die." Also in June, Boyd was recorded preaching to his family, during which he said that "the blood of Muslims has become cheap…because most of the Muslims have abandoned jihad." In another April 2008 recording, Boyd talks with co-defendant Anes Subasic about his concerns that the FBI might become interested in their plans. 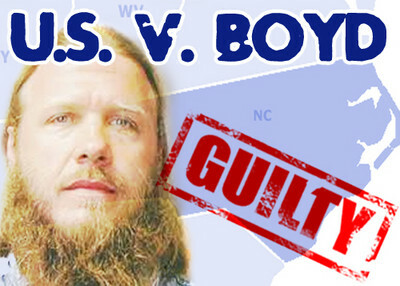 During an August 2009 bail hearing, FBI Agent Michael Sutton testified that government recordings and witness reports showed Boyd saying he would "make jihad right here in America" if he didn't leave the country soon enough and that he wanted to "take out" a group of Humvees and a North Carolina state helicopter. The plea agreement stems from charges filed in an initial indictment from July 2009. Two months later, a superseding indictment charged Boyd and two other defendants with conspiring to kill federal employees as part of a plot to attack the U.S. Marine Corps Base in Quantico, Va. Boyd allegedly traveled to the base to conduct surveillance. Agents found more than $13,000 in cash, 24 guns and more than 27,000 rounds of ammunition when they searched his home in Willow Spring, N.C. He had a trench under his deck for storing weapons. They also found a copy of In the Shade of the Qur'an, a book written by Muslim Brotherhood luminary Sayyid Qutb. He was also charged with several firearms-related crimes and two counts of making false statements to government officials during a terrorism investigation. Prosecutors have agreed to dismiss these additional charges against him in exchange for his guilty plea. Boyd is scheduled to be sentenced in May, where he faces up to life in prison for conspiring to injure others abroad and up to 15 years for his plea on material support charges. The remaining defendants in the case, including Boyd's two sons, Zakariya and Dylan, are scheduled to stand trial in the fall. Oh, but the mu s lim brother hood are peaceful. Yeah, right. And then our idiot intel advisor testifies that it's all good, the MB is all sweet and secular. What a tard.